Let it be known that I personally know and professionally endorse Mr. Steve Wolverton in whatever endeavor he may undertake on your behalf. I am blessed to be able to work with Steve on an annual basis and I have never known him to be anything but well prepared and professional, yet always interested in the views and suggestions of others. Steve has a great ability to communicate on multiple levels with a diverse workforce. I have always found him to be task friendly and goal oriented, with an understanding of the overall needs of the project or event. Steve works smoothly with professionals and lay persons alike. It is my firm belief that your ministry or business will be well served to have Steve participate in your undertakings. In addition, I believe that you will see a returned “value” far beyond your “expense” every time. Steve has a servant’s heart and a “can do” work ethic. I have personally experienced Steve to be calm under fire, while remaining encouraging and uplifting to those around him. Once again, I heartily endorse Mr. Steve Wolverton. I wish to tell a brief story about my life in the church AV booth. I am an anesthesiologist but am active in my church. I answered the call for volunteers to work in the sound booth to help a couple of friends that also worked in the booth. Shortly after I started, both other friends found themselves disheartened at our church and left. Guess what? I was now in charge of the whole thing. That included three services, and the team was two people down. Our equipment needed upgrading and I needed training. I had learned what I could in the short time from the other two guys and from the Ministry leader. The Praise leader knew what he wanted the system to sound like but, frankly, didn’t have the time to teach me. My buddies had learned much of it on their own from trial and error. The Praise leader brought in a technical expert that spent much of his time tracing wires and balancing out the amplifiers and speakers. He gave me some personal time but, to be honest, he spoke over my head because I had a poor understanding of the basic system. Then along came Steve Wolverton. Steve is armed with an in-depth knowledge of all aspects of the technical ministry. He started by giving us a short seminar, breaking the system down so I could begin to understand it. We even talked about how he had built the team up at where he worked. He kept himself available for questions and even quickly responded to my emails many months later concerning software. Steve is a very honorable man, easy to work with and knows his stuff. As a doctor, I know the challenges of talking to laymen about a very difficult subject to teach. Steve was able to give me the building blocks, build on them and make it fun. He even did it without talking down to me or the rest of the team. On behalf of Steve Wolverton, I would like to give my heartfelt recommendation for consideration. I work as a professional programmer and project manager and have worked with Steve on approximately a half dozen projects and conferences and have always had a great experience. Steve is the embodiment of professionalism and works diligently in line with the goals and vision of an organization. On the occasion that an inquiry or problem falls outside of his direct line of management he’s always helpful in locating the right person and getting the problem solved or the question answered. I believe his attention to detail and positive attitude would make him an asset to any organization and his flexible, confident management style would be a great fit for leading any small team on projects of any scope. Personally, Steve is one of the kindest people I have had the privilege of working with. My main experiences with Steve have been working as a subcontractor at summer conferences of approximately 1500 people in attendance. Each year has been a joy. Inevitably, things may happen to go wrong with the conference center, hotel, or personnel. Steve has always been my direct contact in these situations and he’s always been able to solve my problems in a timely manner. He also works diligently in the 'off season', not only to prepare for the next year, but to solve the problems encountered in prior years. In summary, he’s just fantastic at his job. Every year gets smoother. We also depend on Steve for additional staffing beyond the small team we bring and every year the personnel get better and better. It’s evident that Steve has an attention to detail and a desire to reproduce that into the people he works with, through training and counsel. Steve Wolverton would be an excellent addition to any professional team. He has effective management skills and brings several other abilities to the table, from designing, to website management. He regularly shows an above-and-beyond attention to detail, along with a proven ability to train, counsel, and advance the people working with and for him. I served as Executive Director of Aldersgate Renewal Ministries from 2009 to 2015, a non-profit ministry seeking to equip every church to minister in the power of the Holy Spirit. I have known Steve as a member of our staff and as a friend since April of 2007. Steve is an extremely gifted innovator committed to improving our organizational effectiveness. He is a team player who is able to see the full 360⁰ of an organization and to strategize how best to market to a diverse audience. His capacity to see an organization inwardly and outwardly and to candidly and respectfully share those perceptions creates a non-defensive environment that can embrace truth-telling for the sake of better service to constituents. He leads upward, downward and horizontally with equal skill and finesse. Steve has chosen to be a life-long learner. His ability to explore media trends and to wisely navigate the territory between “hip and trendy” and “outdated and ineffective” has been vital. He has played an essential role in our organizational pursuit of healthy tension between being “current and relevant” and staying within our economic means as a non-profit. He has incredible skills, a passion to grow as a designer, and zeal to discover more effective and efficient technologies. He is extraordinarily perceptive, flexible, and operates with a warm sense of humor that helps diffuse tense situations and helps prevent things from getting “stuck.” Reflective of his ability to see long term, Steve is a skilled mentor to younger people, creatively, wisely, and carefully pouring into the next generation of leaders. I am pleased to endorse Steve Wolverton from my viewpoint as a former supervisor and co-worker. I got to know Steve from my former position of Director of Administration for Aldersgate Renewal Ministries. Aldersgate is a Christian ministry with a focus on the United Methodist Church. My wife and I moved to Tennessee in 2002 after I retired as a Senior Project Engineer for Kimberly-Clark Corporation in Neenah, WI. 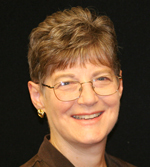 I worked in various positions at Aldersgate until retiring there at the end of 2013. I hired and supervised Steve for about 4 years. The media work at Aldersgate ranges from design and execution of print projects to application and oversight of all digital applications. It has been greatly satisfying to see Steve’s growth during his time with Aldersgate. He came with very good technical abilities that have evolved to excellence in his field. It has been more of a joy to see him mature spiritually over the time I have known him. Steve’s greatest attribute is his understanding that technical applications and expertise must, at sometimes, be deferred to allow ministry to happen. This allowance may mean that the best, most up-to-date, and most impressive technology is suppressed so participants in events can receive the ministry they need from Jesus Christ and event leadership. Only slightly less of an attribute and gifting is Steve’s ability to mentor and release technical teams for their own technical ministry. Steve has taught, led, and encouraged untold numbers of young people into the support of other ministries and businesses. Steve has been an encouragement to those of us that were literally forced into the age of digital “ministry” through innovation. I needed Steve’s leadership and encouragement to guide me personally to understand the importance of technology in the Church today. I am honored to share about Steve Wolverton. First, let me introduce myself and my relationship with Steve. I am a United Methodist pastor and have been for more than 38 years. I have also served as a missionary in The Netherlands with my family, and I am currently serving as a part time Faculty Mentor at United Theological Seminary in Dayton, OH. A few years ago, Steve came to present a training seminar for the Sound/Projection Ministry in my church here in Pickerington, OH. We brought Steve to show us how to better organize this vital ministry, to trouble-shoot our problems, and train our volunteers. It was an excellent workshop for us. Over the years, I have watched Steve’s career grow and develop at Aldersgate Renewal Ministries in Nashville. 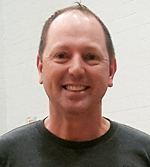 Steve has really impressed not only me, but the entire ARM family with his organizing and networking skills that play a major role in the annual Aldersgate Conference each summer, which takes place in various cities. Steve put together teams of young adults and skilled technical folks to provide a very high quality event. Steve has coordinated and led the technical side of many, many ARM events at the Aldersgate Renewal Center, working with various ministry leaders, making their ministries more effective. Steve works well with others, networking extremely well to provide the most cost effective results. Steve’s attitude is a strong “can do” spirit, making things happen even when presented with some very challenging situations. Steve loves a challenge. Therefore, I highly recommend Steve Wolverton for your consideration. I would be most happy to share more information if necessary. My contact information is below, feel free to contact me. My name is Adam Cannon and I served Director of Youth Ministries for Gallatin First United Methodist Church in Gallatin, TN. I first met Steve at the Aldersgate Conference during the summer of 2010. I was serving in my first Youth Ministry role and had been asked to speak for the Youth-oriented sect of the Aldersgate Renewal Conference known as The Gate. There, Steve served as the administrator, developer and implementer of virtually every technology-driven endeavor. My observation of his technological ability was surpassed only by his humility and willingness to serve with excellence. Prior to and since that summer I have been blessed to receive a great deal of experience and tutelage from many gifted minds in the fields of ministry, business and technology. In my more-than-ten-years’ experience I have worked with few people who could match the professionalism, care and capability of Mr. Wolverton. As an administratively minded man myself, I do well to stay on top of the latest technological trends and advances to implement them into the work I do. Efficiency will always lead to greater gains regardless of the field of work. Steve excels at implementing new technology and somehow shows proficiency in its use almost immediately. This is an area I find Steve to be gifted in like no one I have ever known. Steve’s devotion in his field is unparalleled. I’ve found him to be capable of tackling ambitious projects with budgets and timeframes that most people would simply pass on. He’s not content to complete a project within the bare-minimum parameters, either. Steve will go above and beyond his call with an intense drive to integrity and excellence. He’s one of those rare personalities that longs to see the organization or project succeed beyond his involvement. He’s a man invested. To recommend Steve Wolverton without mention of his character would be a shame. You’ll never meet a kinder, more compassionate man. He’s interested in helping those around him succeed to the same degree of success he aspires to. His positive and encouraging attitude is infectious and it’s one that an entire office would do well to catch. I could not possibly recommend anyone as highly as I do Steve. The qualities he possesses are what has driven my continued friendship with him, but they’re also how I can attach my endorsement to his professional capabilities without a fear or doubt. He’s the kind of person who possesses a rare combination of qualities that would prove substantially beneficial to any organization. I am an Ordained Elder in the Tennessee Conference of the United Methodist Church, having served a number of churches throughout the Tennessee Conference as pastor, since 1996, as well as holding a number of conference and district level leadership roles. In January of 2014, I stepped out from pastoral ministry to fulfill the role as Executive Director of Aspen Tree Ministries. 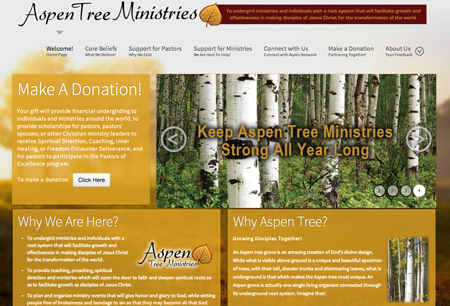 Aspen Tree Ministries (ATM) has been established as a 501(c)(3) ministry with its mission to undergird ministries and individuals with a root system that will facilitate growth and effectiveness in making disciples of Jesus Christ for the transformation of the world. I had observed Steve Wolverton for several years in his role with Aldersgate Renewal Ministries as the Director of Media, but I never really got acquainted with him until I had the opportunity to begin speaking at a number of their events. In those times, I found Steve to always be helpful with my media needs whether that included projecting notes, or merely having me “mic-ed” and ready to speak. When using projection notes, I could rest assured that Steve would follow my message and align my notes with my words. Steve’s abilities and quiet, behind-the-scenes encouragement would always give me the confidence I would need to know that I would be “well presented.” In the big world of media, these seemingly small acts of service that I personally experienced were the times that I began to grow in my appreciation for the “ministry” that Steve puts into his media work. 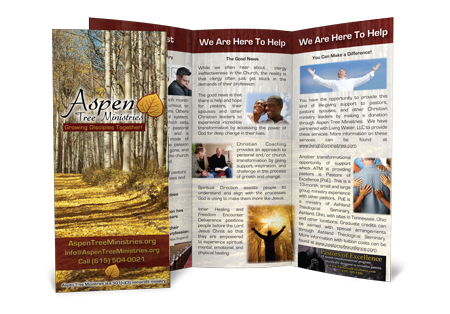 I never really knew the scope of Steve’s ministry, nor his incredible expertise in the media field, until I stepped into my role as Executive Director of Aspen Tree Ministries and found myself in need of someone who could guide my beginning efforts to produce quality brochures and to set up a website. In all of my interactions with Steve, as he assisted Aspen Tree Ministries in these endeavors, I have found him to be amazingly gifted and skilled. He has had the incredible ability to listen to my thoughts, and then to develop a finished product that has far surpassed my expectations each time. The high quality of work that Steve has produced for ATM has given credibility to a fledgling organization. 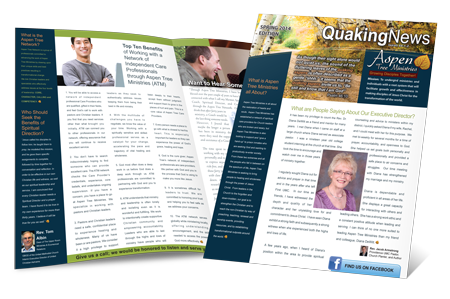 When people receive our brochures or visit our website, they take notice because of the quality of the materials and the set-up. One of the most incredible characteristics that I have observed in working with Steve is his selfless desire to see others succeed. 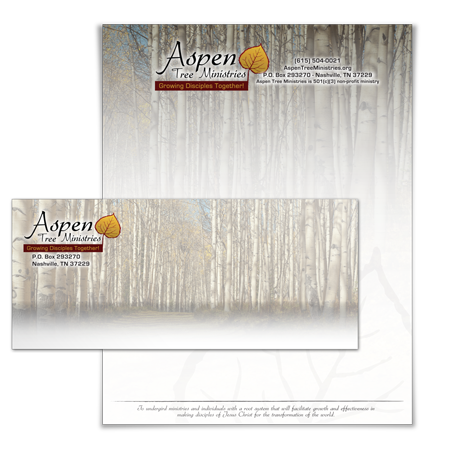 He has truly poured himself into creating media products for Aspen Tree Ministries that have set our ministry on the course of success, where people would take notice. I have also witnessed his desire to see young people succeed in the media field as he guides their involvement in the work. He enlisted the help of a student intern whom he instructed and guided in the creation of our brochures and website. Steve’s heart and desire seems to be for others’ success. He is authentic and sincere in all of his interactions. I would highly recommend Steve for any aspects of media work, both because of his expertise in the field, as well as his heart to position others for success through his work and encouragement. He is sincere in his faith, genuine in his attitude, and extraordinary in his work. Key Team Member at a Design Company in Clarksville, TN. I am pleased to provide an employment reference for Steve Wolverton. Steve has been employed at my printing business since the fall of 2001 to 2007. At that time he was attending Austin Peay State University and was a key employee for my company. Steve is a very talented graphic designer. He has learned the entire printing process during the last six years. Steve has been very involved in both school and church activities. He has demonstrated strong leadership skills in working with church youth groups. Steve is a dependable, honest, loyal, hard working employee. You could leave a hundred dollar bill on the desk and be confident that it would be there a month later. He demonstrates attributes that are sought by employers today but are becoming more rare than in past years. Steve can be trusted to perform his assigned duties. Without reservation, I recommend Steve for employment with your organization. If you should need additional information, do not hesitate to contact me. Owner of Clarksville Quick Printing for over 40 years. My name is Matt Burden, and in this letter I would like to recommend my friend and former brother-in-law, Steve Wolverton. I have known him for over 8 years, and we've worked together in a variety of ministry settings. As a career missionary with Youth With A Mission, I served in The Americas, Europe, Asia, and Africa, and he occasionally provided contract jobs with Aldersgate Renewal Ministries (ARM) for me when I came home on a break. He married my sister in 2008, with whom he co-led a thriving youth ministry in Gallatin, TN. Whenever I would return to the States I would visit their church and participate in their youth ministry activities. Steve's natural talent and passion for youth ministry is evident to all who know him. He is always ready and willing to sacrifice time, energy, and resources to achieve the maximum results. This is perhaps one of his greatest attributes. More recently, I've moved back to Columbus, OH, to serve in a young church-plant where I still draw on the things I learned from him and the work ethic he modeled. I've met a lot of Youth Ministry volunteers, but Steve's character, experience, and commitment truly makes him stand out. What sets Steve apart? The small things he does with great humility that falls under most peoples' radar. Of course, he boasts of the standard qualities that make for great ministry leaders like a deep love for Christ and his church, integrity, communication, time management, and people skills. Yet Steve excels at going the extra mile as a life-long learner. You'll find him continually doing research and reaching out to friends and experts who can provide wisdom from their experience. In addition, his care and engagement with people is genuine, and you'll always see him looking for ways to meet the needs of those around him. Fearless and high-energy, Steve boldly faces challenges, and patiently takes the time necessary to develop sound strategies. All that said, the highest commendation I can give for Steve is by telling you that I would confidently entrust any project or ministry of mine to his care without hesitation. All this, backed by his deep love for Christ and his church, is what makes Steve the leader you want. 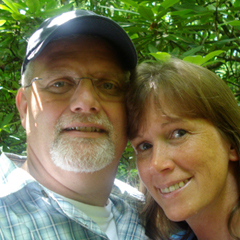 I am writing this letter of reference for my friend and church member, Steve Wolverton. It has been my joy to have Steve as my friend for more than a year. He and I have entered into a discipling relationship, and Steve has allowed me to speak into every area of his life. It is from that perspective that I recommend Steve to you. Steve is a man of integrity, seeking to follow Christ in all that he does. He is conscientious about the work and the counsel he gives to people he works with and is responsible, fulfilling his commitments and doing what he says he would do. He is a man of his word. In his chosen vocation, he is a lifelong learner and someone who is always working on mastering the latest in technical developments in web design and in the world of delivering events in new and compelling ways. He is a dedicated employee and someone who goes the extra mile to deliver projects on time and under budget. More than that, he genuinely cares about the people he works with, developing them as leaders and increasing their knowledge and skill as he moves forward with them. He is also a leader, in his workplace and also in our church, where he teaches and leads our middle school boys weekly. He cares about them greatly, and cares enough to ask them the hard questions and gives them tough love when it’s needed. He is the kind of example and leader we search for as we look for great leaders in our youth ministry. In closing, if you are considering adding Steve to your ministry or your workplace, you will be adding a skilled and conscientious leader, who will make your team better in every way. Please feel free to call me or email me if you have any specific questions I can answer about Steve. My name is David Layne and I serve as Student Pastor at The Bridge Fellowship in Lebanon, TN. I have been a part of this faith community for the past four years and through The Bridge Fellowship I have had the honor of getting to know Steve. Steve serves on our student ministry leadership team as a small group leader for our eighth grade boys. He is everything you would ever want in a leader that invests in students. Steve is a very passionate guy that is willing to do anything for the betterment of the team. I would highly recommend Steve in any type of leadership role because I know that he always brings his best and he is prepared to go the extra mile if needed. One of his greatest strengths is the way he strives for excellence, and it is because of that strength you do not have to worry about anything you put him in charge of. Any company, ministry, or organization would be very lucky to have Steve as part of their team. My name is Margie Burger. I served Aldersgate Renewal Ministries as Director of Prayer from 2002 to 2014. 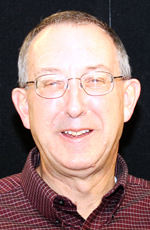 Steve joined the staff of Aldersgate in 2007. I worked with Steve on a variety of projects including our national conference on Spirit filled living, events at our Aldersgate Renewal Center in Goodlettsville, TN, prayer events, women’s ministry events, and preparation of materials for publicity and printing. Steve leads and ministers with integrity, passion, commitment and a sense of humor. He seeks to continue to grow spiritually and is committed to growth in media development. His role as Director of Media greatly enhanced the ministry of Aldersgate. I grew to especially appreciate his skill and passion to equip others for ministry through media. Steve poured his time and energy into mentoring young people. He is a strong leader. One of the highest qualities of Steve Wolverton is that he leads with a servant's heart and really thrives in helping, mentoring, and watching others succeed. He was able to recruit and train an amazing group of volunteers for our new campus. His volunteer technical teams were able to run and operate their duties like veterans in a short period of time. Not only is Steve gifted in leading and training a tech team, he really invest in people's personal and spiritual lives by helping them to grow in their relationship with Christ. I'm personally grateful for Steve willingness to be a team player by being patient, flexible, and willing to go above and beyond his job description in making our new campus successful. My name is Shelby Craft, President of Craft Tech Solutions based in Nashville, TN. I have had the pleasure of working with Steve on numerous occasions over the 4+ years I have known him, and I have always found him to be a true IT professional. He has the ability to handle multiple projects while dealing with all of the people involved with excellence! He is honest, hard working and always delivers. I would recommend Steve to anyone looking for those qualities.